We are proud to be the only contest site with two alternate options for entering tourney picks and — at the risk of immodesty — we think they’re both great! Whether you’re new to our site or an old pro, we thought it might be helpful to do a quick overview of the Speed Picks and Pro Picks features. 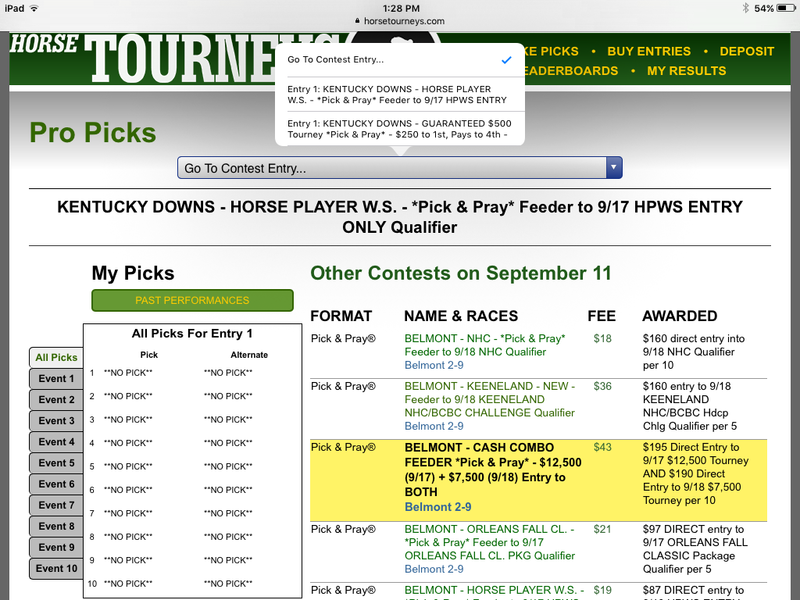 When HorseTourneys started, the only way to enter picks here and at other sites was to toggle back and forth from one race page to another. And you can still do this, of course. But if you’re like a lot of players, at this point you’ve completed all of your handicapping and know who you like in every race. 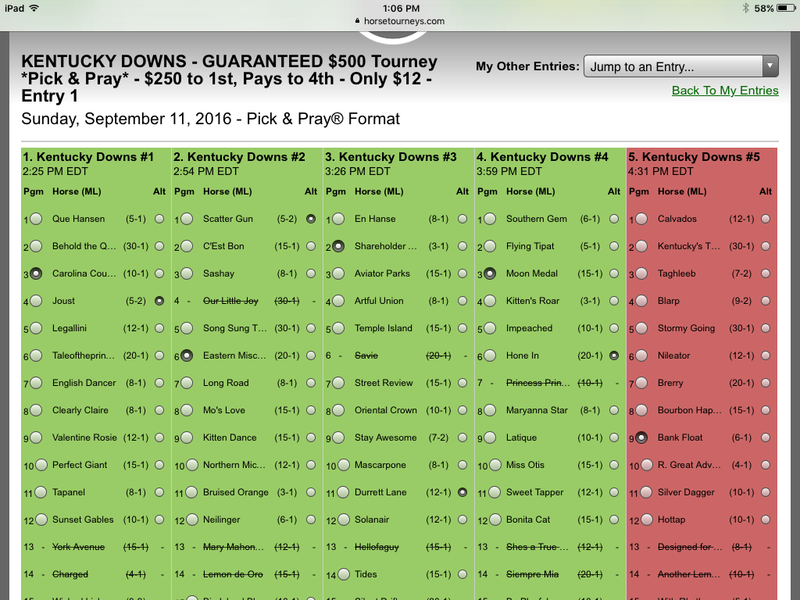 In this case, you just want to input your picks onto our selections page as quickly and easily as possible. (This could be especially true if you have entered a Pick & Pray at the last minute and are really up against the clock in terms of getting your picks in before the deadline.) Herein lies the beauty of Speed Picks (my personal favorite when I am playing just one tourney in a given day). 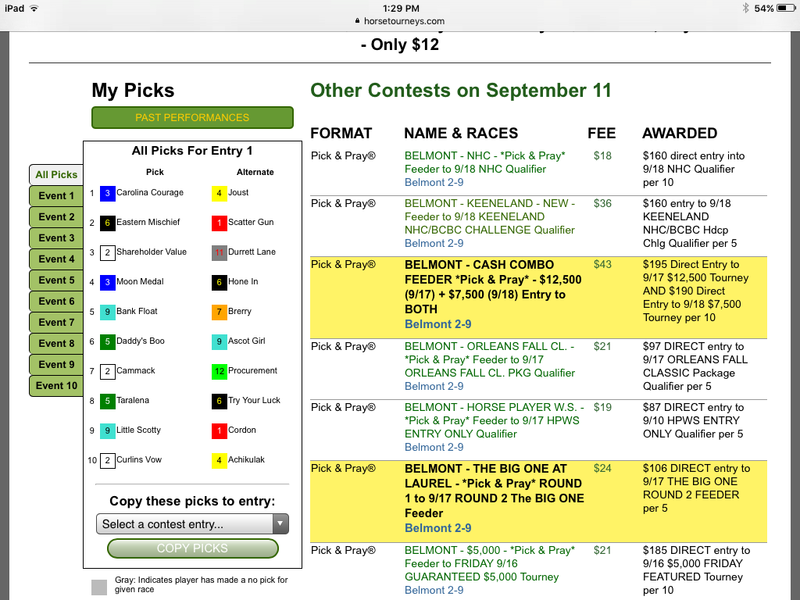 Speed Picks offers you a single-page view of all races in a tourney with the option to enter both a main selection and an alternate selection for each race. Each race starts out with a white background, but once you enter both a main pick and an alternate pick for a race, the background turns green, meaning you are completely good to go for that race. If you just enter a main pick but no alternate pick, the background will be red to alert you that you still have the option to enter an alternate selection. Pro Picks is another option for entering multiple picks quickly. Many people find it is of particular value when you are playing more than one entry in a given tourney or more than one tourney in a given day. 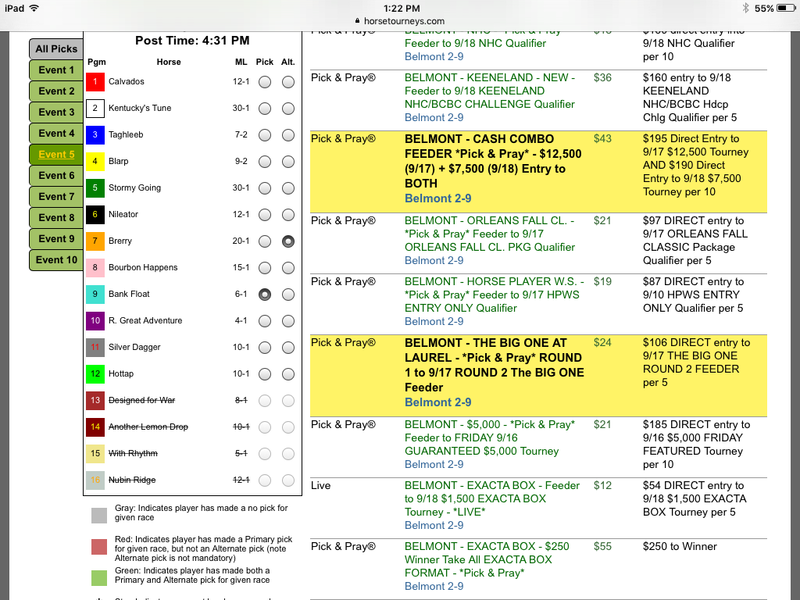 Above is a look at what pops up when you click on event 5 of your contest — you get a pop up of the horses in that race so you can enter your main and alternate picks. 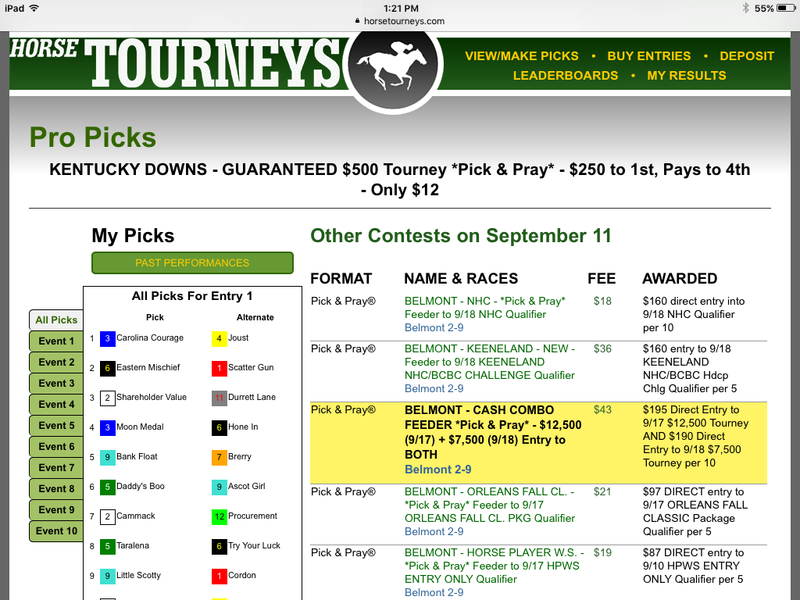 When all of your race picks are entered, you can click on “All Picks” in the upper left and see all of your selections for this tourney at one glance. …If you have entered multiple contests, you can click the “Go To Contest Entry…” dropdown menu at the top and you can click on any of the tourneys you have entered — all from this same page. Now let’s say you have made all of your picks for your first entry, and you want to enter those exact same picks for your second tourney (this assumes, of course, that the contest races for the second tourney are the same as in the first tourney). You can click on “All Picks”, view your picks for one tourney, then at the bottom (where it says “Copy these picks to entry:) you can select another tourney you’ve entered and copy those picks to that one automatically. Of course you will be asked if you’re sure you want to do this, just to prevent against someone copying picks by mistake. Many of our players playing multiple tournaments like to use the same picks in all tournaments. Pro Picks lets them execute this quickly and easily. But even contestants who play multiple entries in the same tournament like Pro Picks because it enables them to see their picks for entry #1, quickly copy them to entry #2 and then make changes to some of the entry #2 picks in order to “spread” where it suits them and to “double down” (i.e. 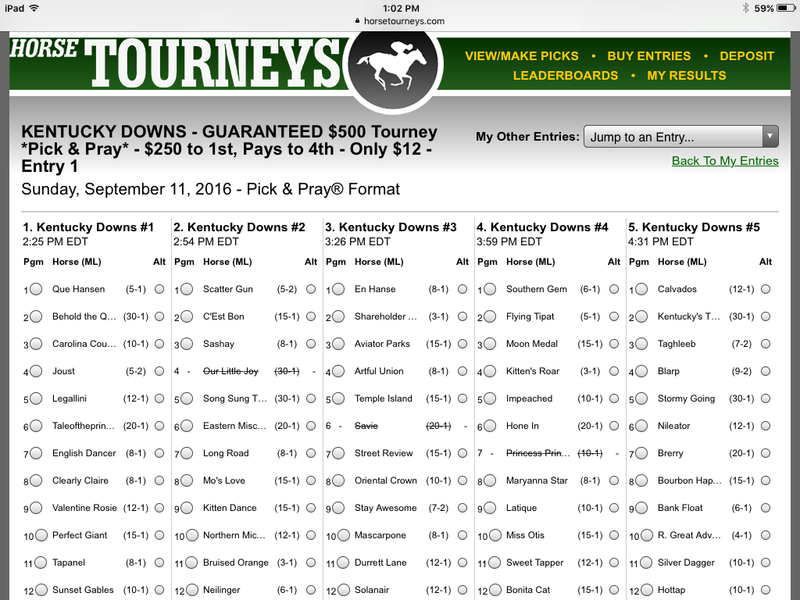 use the same picks in both entries) when they are confident in using only one horse for that race. It’s almost like editing a memo before you send it on to your boss. For a good while, I entered my picks the old fashioned way by going back and forth from one event page to another. When I discovered Speed Picks, I was immediately hooked…and also felt a little stupid for not having tried it out earlier. 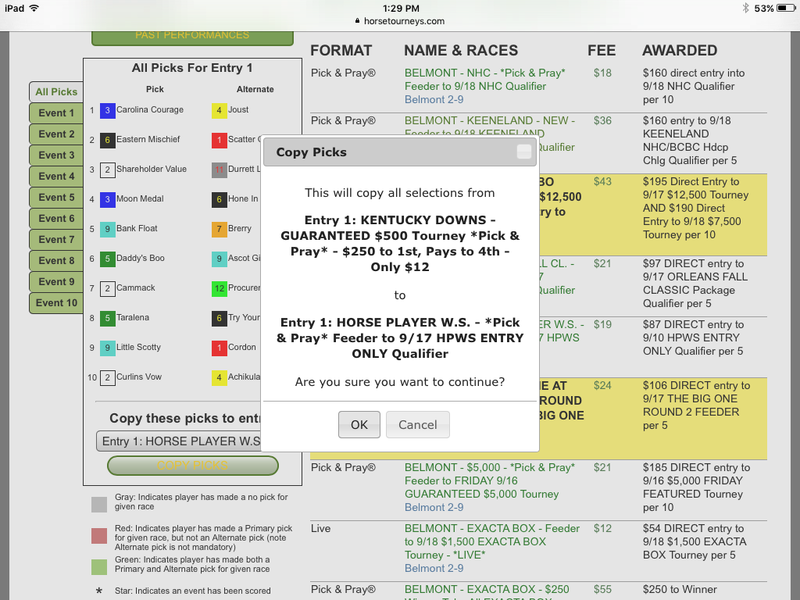 And Pro Picks takes the user-friendly technology one step further for the “multi-table” player to help him or her save time and (more importantly, as far as I am concerned) stay better organized as you manage your multiple entries. We are always looking for ways to give our players the best user experience possible, and we hope you will explore these options if you haven’t already done so. Keep in mind, though, that the best option for you is the one you are most comfortable with. Technology is a great thing…as long as YOU manage IT and not the other way around!